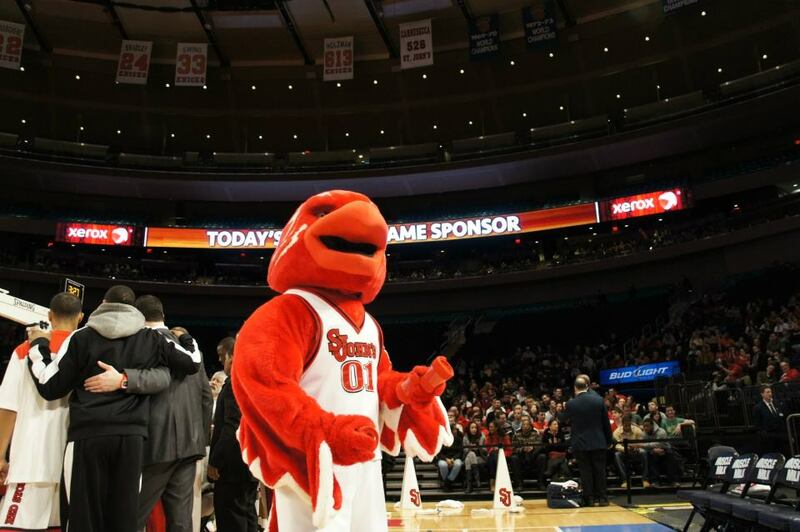 BIG EAST Basketball Dedication: What Would You Do to Prove You’re the Biggest Fan? 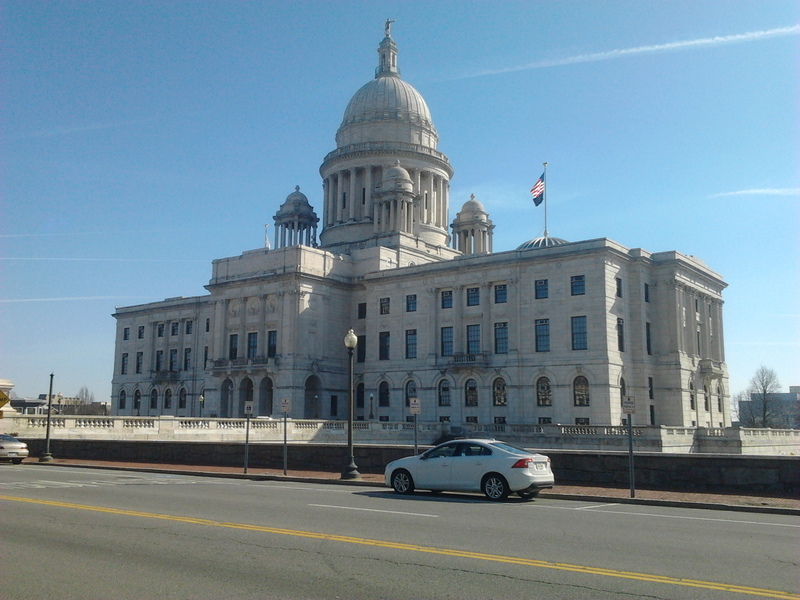 Started my journey in Providence, R.I., right near the state capital. be an understatement. While in Queens, I worked as a student worker and then a graduate assistant as I completed my bachelors and masters degree, so even though I have probably seen close to 125 Red Storm games, I have probably only seen five as just another fan in attendance. I had planned for a great weekend with my best friend in New York City, but as a Sports Information Director, many know that the best-laid plans do not always come to fruition. I currently work as an SID for Brown University and our women’s hockey just happened to do something they had not done since 2006. They made playoffs for the first time in six years under their first-year head coach. This threw a slight monkey wrench into my plan. The payoff of a 9-hour trek? The greatest city in the world! Basketball,” I found that I was heading to Ithaca, N.Y. for a three-game series of ECAC Women’s hockey. Luckily, I wouldn’t let a little thing like 200 miles stop me from competing in this contest, especially when a chance to see the Red Storm and the “Fresh Five” live in action was involved. For those of you who don’t know, St. John’s is starting five freshmen for the first time in program history since the “Wonder Five” in 1927 and have a chance to make one of the biggest impact since C-Webb, Jalen Rose, Juwan Howard, Jimmy King and Ray Jackson formed the “Fab Five” at Michigan. As fate would have it, another SID from my department would also be heading to Cornell that weekend. With the gears turning at full speed, I devised a plan for her to stay in Ithaca, as I would head down to the City after Friday’s game had commenced. This way, I could actually make St. John’s all-important showdown with No. 18/20 Notre Dame. But, this also meant more work for me. 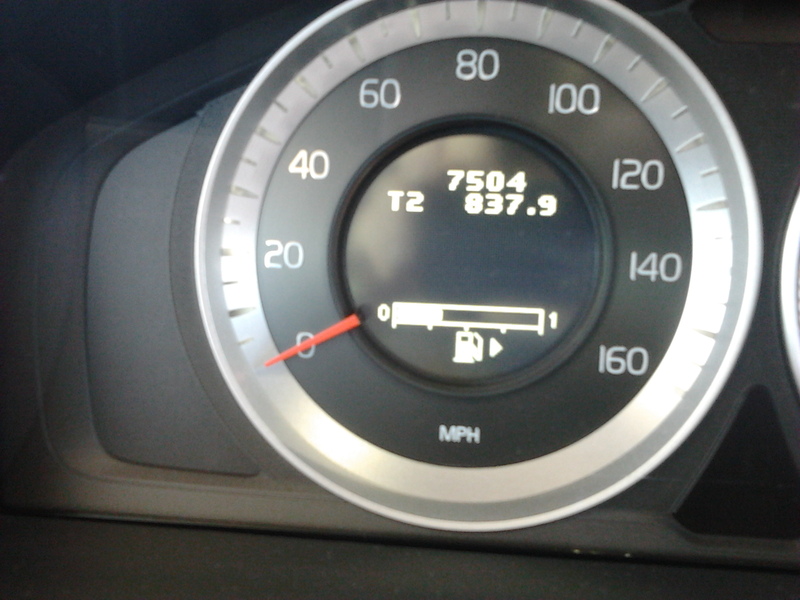 Thursday, February 23, 2012: Thanks to kind folks at Steingold Volvo in Pawtucket, R.I., they allowed me to pick up my Volvo S60 a day early as instead of driving straight down Route 95 from Providence to New York, I went up to I-90 through Massachusetts and into “the sticks.” Six hours later and I was in Ithaca, N.Y., home to Cornell University. 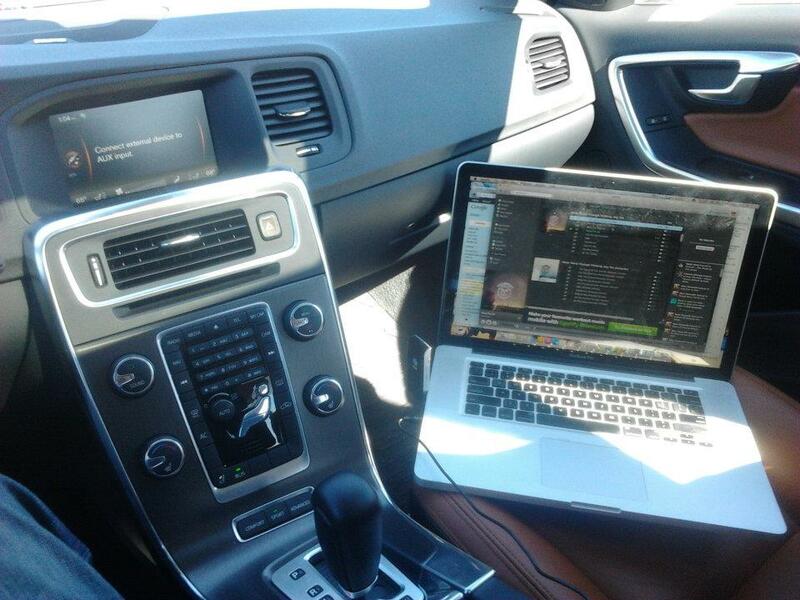 Stream Spotify through your MacBook into your Volvo speakers? Yes, Please! made a symbiotic connection with the S60 as it now responded to my every move, nearly driving itself, warning of traffic and cars near me, alerting of directions I needed to take, taking control of my iPod, syncing with my cell phone through blue tooth and riding like a dream (note; that whole last sentence was not actually due to a symbiotic relationship, but was what this Volvo does in real life. Amazing.). Friday, February 24, 2012: Gameday. No not that gameday. The Brown women’s hockey team plays its first playoff game in nearly six years. Unfortunately, it came against nationally-ranked Cornell Big Red, which boasted six Olympians, I repeat, six Olympians, and was number one overall seed in the ECAC Hockey playoffs on top of being the number three team in the country. Despite the odds, and facing a 3-0 deficit in the second period, Brown fought their way back into the game, scoring two goals in the second and nearly tying it up in the third, before Cornell was able to regroup and net the clinching goal mid-way through the third to seal a 4-2 victory. Despite the loss, the Bears proved they could stay with the nation’s best, just a year removed from winning just two games and totaling over 20 losses. I made it to the Garden! them play the next day. Although I did cheer up a tad, snuggling into the two-toned leather seats of the S60 as I made the four hour trek from Ithaca to NYC. 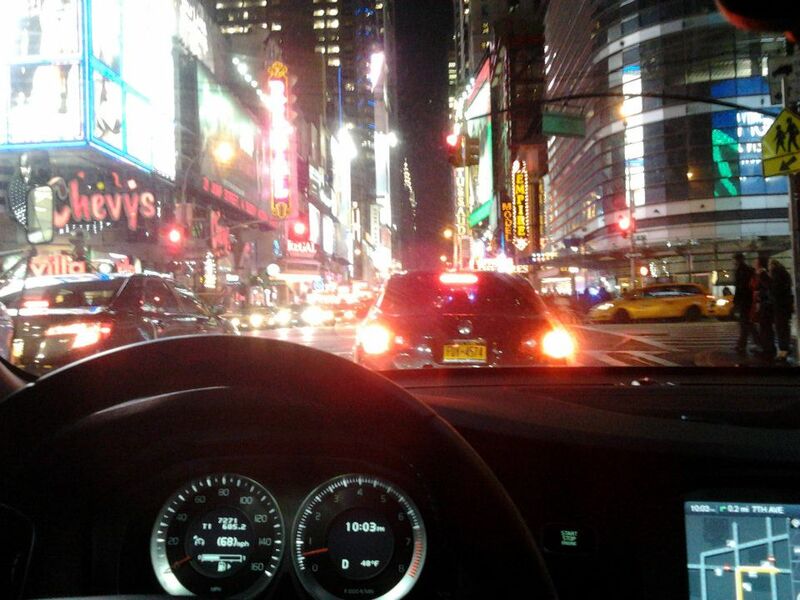 Thanks to the Volvo’s built-in navigation system I made it down into the city and to my hotel (which right across the street from Madison Square Garden) in just about four hours, just as the car/computer/new best friend told me it would take. One important tidbit I left out from today’s recap was that today was in fact my birthday. It definitely was not how I had anticipated spending it, but looking back, I wouldn’t change a thing (aside from possibly a Brown win). Woooo! Happy BDay to me. 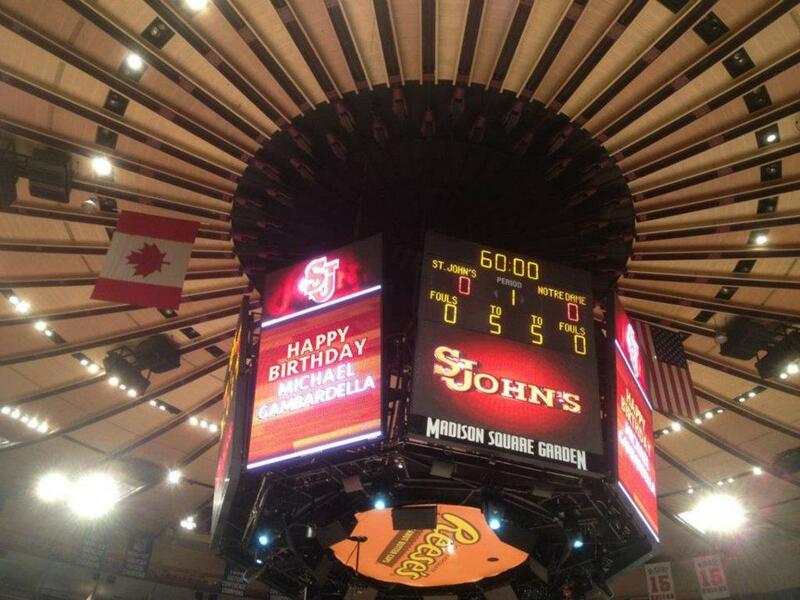 Thanks MSG. from the Garden. After a fantastic night of catching up and soaking in the auroa of the city, I headed back to the hotel with excitement building for a big game tomorrow afternoon between St. John’s and Notre Dame. Saturday, February 25, 2012: Gameday. Yes, that gameday. I woke up and made the trek to Dunkin Donut’s (any self-respecting Rhode Islander needs their large iced coffee to start the day) before making the long trip over to the Garden. Ok, the Dunkin was more or less in the lobby of the hotel and MSG was across the street but after “catching up with my frat brothers” the night before, it felt like it took a lot longer. It was fantastic to see all the improvements they made to the Garden since I had last been there, completely renovating the concourse and replacing all of the seating in the lower and mid-bowl sections of the arena. 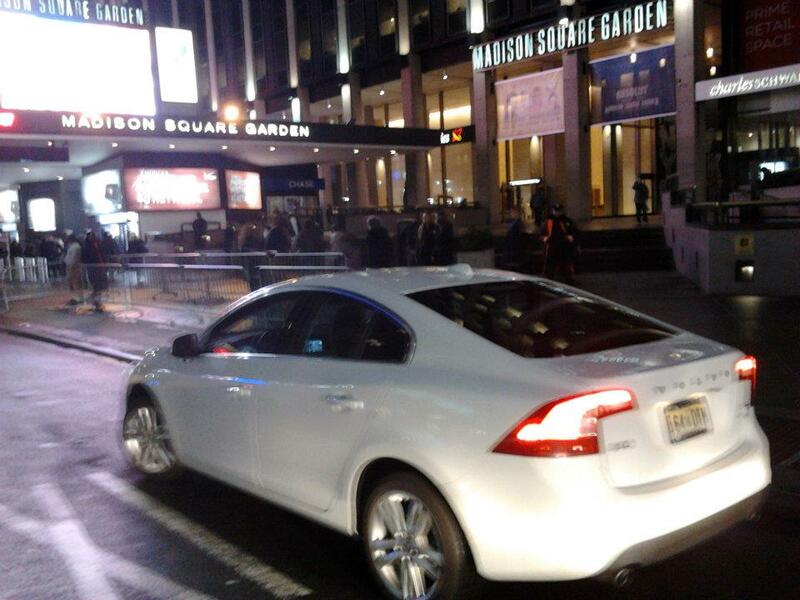 I actually entered MSG an half hour early, just walk around and soak it all in. Volvo set me up with near $100 tickets for the Red Storm game, but me being me, decided I could get a little closer when the usher wasn’t looking and ended up sitting six rows back from the bench. St. John’s came out to take an early lead and held the advantage into half time. I’m not about to say that I was the extra push that they needed, or perhaps it was the bow ties (In honor of “On the Line” for prostate cancer awareness week) in addition to the usual air force ones, but the Red Storm looked great against the 18th-ranked team in the country. Their defense clamped down on the usually hot-shooting, deep-range Irish and STJ matched them step-for-step. Well if you haven’t heard or seen yet, my halftime was much different than the usual fan’s or even what I used to do as a student worker or graduate assistant. The video below will do a much better job of explaining. 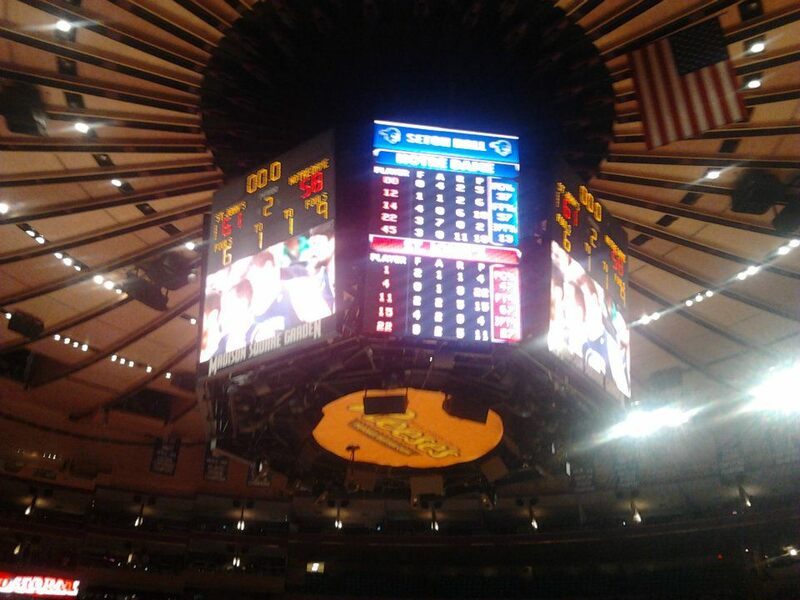 The Red Storm actually spent most of the 2011-12 season in 16th and last place in the BIG EAST in 3-point shooting but on Saturday at Madison Square Garden they held Notre Dame to its worst game of the season from beyond the arc and it equaled a 61-58 upset over the No. 18-team in the country, the Johnnies first win of the season in 11 games against a ranked team. As if just being their for a game like that was not enough, I got to spend the rest of the afternoon with friends and coworkers from St. John’s… at least until 5 p.m.
counterpart, I had to cover a Columbia women’s basketball game that night. I went from the hotel to the train to Columbia’s campus to sit courtside as the Brown Bears took on the 3-21 Columbia Lions on senior day. I guarantee you that no other contestant worked on the same day as their alma mater trip, but I did the day before, day of and day after. #SIDProblems. Finally, once I had finished my write-up of Brown’s win and posted it to BrownBears.com (shameless plug), I was able to head back to the hotel, change again and finally head cross-town to meet up with my friends who had been patiently waiting since 5 p.m. for me. Hope there wasn't a mileage limit. wearing far too much spandex) and before we knew it the Giants’ Selvish Capers and the Jets Ropati Pitoitua were up on stage, with Selvish displaying his World Championship ring to everyone (slight barf as a Patriots fan). This is just about what I expected when we did our “predict your Volvo Alma Mater trip,” minus the whole Giants champion thing. Sunday, February 26, 2012: So after a day that includes a Top-20 upset by your alma-mater, dressing up as you team’s mascot in front of over 11,000 people, catching up with some of your oldest friends, working as a media relations director for a women’s collegiate basketball game, seeing one of the greatest 80’s cover bands ever (shoutout to Rubix Cube) and then having drinks with a (ugh) Super Bowl Champion, what is the best way to spend the next day? The only answer is a three-hour drive in a brand new Volvo S60. 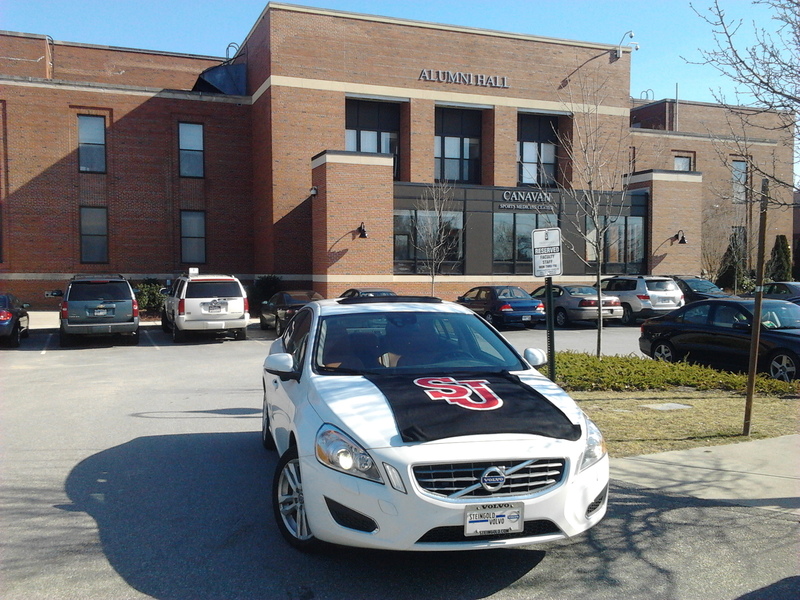 Sorry Providence College and Alumni Hall, when I'm in town, it's all about STJ! So in the end, thanks to a day full of meetings on Monday, I had a total of SIX days with the Volvo S60 and traveled over 830 miles. If that isn’t dedication, I don’t know what it is. So in total, it was six states (RI, MA, NY, NJ, PA, CT) in just two 24 hours and one trip I will not soon forget. As always, please continue to vote for me and St. John’s in the MyBigEastVolvo.com poll and be sure to follow me on Twitter @BIG3Sports. Also, check out my fan page on Facebook.